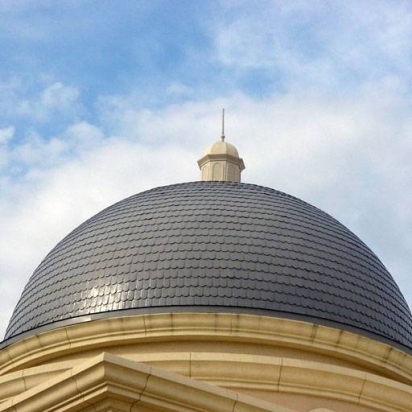 Enjoy the benefits of GFRC for construction of custom domes. Concrete was the material of choice for decades for all types of buildings, structures, and applications. However, a relatively new material developed in the last 30 years known as GFRC (glass fiber reinforced concrete) has changed the construction environment, offering considerable advantages for the contractor, architect, and developer. GFRC is a concrete composite product that includes glass fibers, polymers, and aggregates. Since it is an engineered material, the mix design, production method, and glass fiber content can be different based on the type of construction project. For example, the more glass fiber that is added to the mix, the stronger the final material. Tested in a number of harsh environments, the comparison below between concrete construction and GFRC construction is based on numerous lab tests. Concrete is solid and, therefore, very heavy, which makes it challenging to work with, especially when it must be lifted and transported. In contrast, GFRC is thin and hollow, which saves on transportation and installation costs. The lightweight quality of GFRC also reduces building load. While concrete is heavier, which would then make it seem plausible that it would be stronger and more durable than a material that is thin and hollow, this is not the case with GFRC. The use of glass fiber actually offers superior strength over concrete, withstanding weather erosion, freezing and thawing, hurricane force winds, fires, earthquakes and floods. This resistance to disaster and the elements makes it a superior construction choice. Solid concrete is a good choice if you are seeking fairly straightforward shapes that do not require many carved details. However, if you are looking for various shapes and want to use intricate details, GFRC should be your construction product of choice. It can be cast into virtually any shape to be used for wall panels, columns, domes, fireplace surrounds, moldings, bas relief and medallions. In returning to the factor of weight, GFRC requires less material and lowers transportation waste, which reduces the environmental impact of the overall construction project. Additionally, because GFRC is so long-lasting, it is much more earth friendly than concrete that has to be replaced over time. Although some people enjoy the look of regular concrete for its minimalist aesthetic, others want something more. GFRC provides that something more, offering various colors, stains, and finishes as well as textures that have the look and feel of natural stone. With a freedom of design, GFRC can look like terra cotta, wood, or smooth panels as well as brick, exposed aggregate, and coral stone. As a pioneer in the development of GFRC, Stromberg Architectural has completed more than a thousand projects, solving numerous design challenges and offering greater design freedom for contractors, engineers, and architects. Now is the time to experience the advantages of GFRC. To get a free estimate for your construction project, use our online contact form or call us at (903) 454-0904.